Lead poisoning may seem like a malady of the past, but unfortunately lead is still present in many household items today. One of the most alarming places lead may still be found is in the ceramic tableware and drinking glasses we use on a daily basis. Lead is a toxic substance that accumulates in the body over time. Therefore, although some lead-containing ceramics and glass may leach very small amounts of lead, if used daily over a long period of time they could pose serious risks to your health. Lead is an integral part of the manufacturing process for most ceramic products. This article gives a good overview of why that is the case, and which ceramic products are most likely to contain hazardous amounts of lead. Lead is found in the glaze of ceramics and brightly colored decorations. The amount of lead that can leach from ceramics varies greatly depending on how the product was made. Certain ceramics are best avoided all together or only kept for decorative purposes; traditional Latin American terra cotta, decorative ceramic found in many Asian market, and some home fired pottery to name a few. Food Safety News published an article about a study, which found high lead levels in many ceramic dishes purchased in Philadelphia’s Chinatown. Additionally, antique tableware is not recommended for everyday use, as lead standards changed significantly in the 1970's. Another possible source of lead is drinking glasses. There are two types of drinking glasses that should be avoided. First, avoid leaded crystal glasses and decanters. Significant amounts of lead leach into alcohol stored in leaded crystal over a few months. Lead is also detectable in drinks held in crystal after only 20 minutes (source). The second type of drinking glass that should be avoided is much more likely to find its way into the hands of children. Do you have any glasses with decals on the front? Lead has been found in a number of these types of glasses. The worry is they are often targeted toward children. A study commissioned by the Associated Press in 2010 showed a number of drinking glasses displaying popular character decals exceeded the federal limit for lead up to 1,000 times. An independent consumer found lead in the decal of his beer glasses. Small amounts of lead can easily rub off onto hands and enter the body. 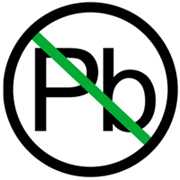 The presence of lead in dishes and glass we use daily is very concerning. Buying certified lead-free glass and ceramic glasses is the best way to have peace of mind.